After two commanding wins on their home court, Luxembourg are set to proceed to the next phase of the qualifiers for the EHF EURO 2022, as a win against Great Britain would definitely see them through. However, Group B is much more complicated, with Cyprus and Georgia both boasting two wins after the first two matches. Their mutual encounter will be played tomorrow in Malta, as the winner will proceed to the next phase. The draw would help Georgia, who have the better goal difference. Returning to their first EHF EURO Qualifiers since 2013, Great Britain had little chance against Luxembourg in their first game, but came back roaring against Ireland, leading from start to finish to cap off a comprehensive performance. With their focus on growing young players, Great Britain showed remarkable maturity to earn an impressive 32:26 win. A great start was rapidly cancelled by an Irish resurgence, but the British side were better and jumped to a 10:7 lead after 15 minutes. With 22-year old Josh Da Silva in superb form, scoring seven goals, the British team managed to keep their lead at the break, 15:12, but found themselves in trouble early in the second half. A superb comeback from the Irish side, backed by a nine-goal performance for Steffen Meyer, tied the game at 20:20. But it was the British side who kept their cool and managed to win. A 6:1 run spurred by Brian Negrete Lindsay was enough to help the Britons earn their first win in the tournament, 32:26. As both teams recorded wins on Friday, both sides knew they would be virtually through to the next round after only two games if they won Saturday’s clash. However, the hosts made it look easy, and Bulgaria never stood a chance. Bulgaria took the lead in the first four minutes, 2:1, but a 6:0 run for Luxembourg was enough to set the two teams apart. Every Bulgarian chance to turn the game on its head was easily repelled by the hosts, who took a commanding 15:8 lead at the break. The gap was cleared in the second half, with the restless hosts pounding, as the lead grew to 25:12 after 40 minutes. Ultimately, Luxembourg won by a 19-goal margin, 36:17, that virtually sees them through to the next phase of the competition. Luxembourg will only lose the first place if they concede the game against the British side and Bulgaria lose against Ireland, or if they lose against Great Britain by at least 12 goals and Bulgaria win their last game. A 27-goal win against Malta saw Georgia as the favourites to win the group, yet their second game against Azerbaijan showed that Djordje Rasic’s team still has plenty to work on before their clash against Cyprus on Sunday. With their thoughts surely turned to their next match, the Georgian side had to sweat more than expected to claim the two points against a motivated Azeri side. The Azeris led for the first time after 12 minutes, 5:4, but Georgia quickly turned the game around, only to see themselves coming from behind again, 10:9. There were four lead changes until the break, but the favourites still had the upper hand after 30 minutes. But just as in the previous game against Cyprus, the Azeri faltered in the second half. As they desperately tried to keep the Georgian side at bay, they could only tie the game after 36 minutes, 19:19, but everything went downhill after that. The Azeri side could not cope physically with their opponents. 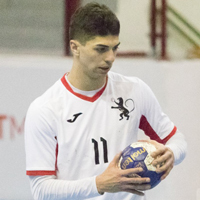 With Revan Chanturia and Giorgi Tskhovrebadze – Georgia’s best scorers, with six goals apiece - running riot in offence, Georgia jumped to a 30:25 win. They will surely need more in the game against Cyprus tomorrow, as both teams are levelled with four points at the top of the group. Cyprus had no trouble disposing of Malta. The hosts led only for the first minute, after scoring the first goal. However, it quickly became a matter of how many goals the Cypriot side would score, as they tried to match the Georgian win from Friday, when Malta was thoroughly beaten, 48:21. With only a 10-goal difference at the break, 17:7, it was clear that Cyprus needed more of the same in the second half. Despite a strong defence, they could only manage a 38:20 win. That result means Cyprus must win their last game against Georgia on Sunday to claim the first place in the group. Otherwise, the Georgian side will win, as the draw would give them a better goal difference (+32) than Cyprus (+26).